This Kenable HDMI Male to DVI-D Cable Lead is ideal for connecting all manner of household electronics. 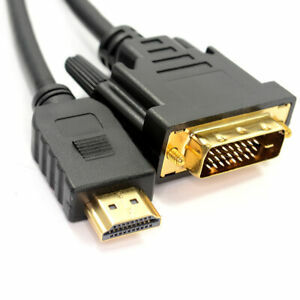 This gold-plated cable can be used to connect computers to projector screens, your laptop to a HD television or other screen display, and many other configurations. The gold plating of the connectors ensures fewer errors in transmission, delivering a much sharper picture quality that's essential for enjoying home entertainment to the max. Er zijn 3.976 objecten beschikbaar. Voer een getal in dat minder is dan of gelijk is aan 3.976.